Did you know that Blackbeard actually sailed the Outer Banks waters and holed up on Ocracoke Island? He also lost his life there at the hands of Captain Robert Maynard. His headless body was said to swim around the ship a number of times before succumbing to death. 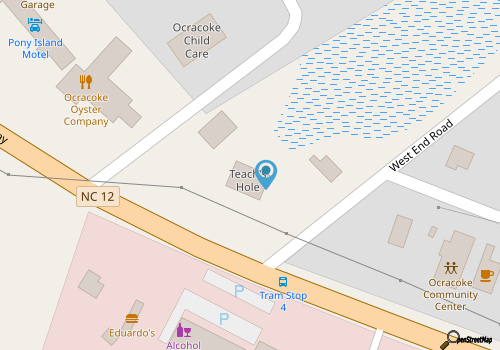 Named in honor of the treacherous scallywag, Teach’s Hole is a delightful stop for kids of all ages. Who can resist learning more about these colorful and larger than life figures in history that have made the Big Screen even today? Teach’s Hole boasts of having the largest collection of pirate paraphernalia on the Outer Banks with over 2,000 pirate-related items. This includes music, flags, toys, books, swords, music, maps, weapons, old bottles, Blackbeard scale ship models, art and even a life-sized figure of Blackbeard. Watch a documentary on the life and death of the most famous pirate in history, and take home a little bit of the magic as well from this exhibit and specialty shop. The kids and kid in you will enjoy the visit. The posted hours are spring hours. Call for summer hours. Call 252-928-1718 for current hours.